I just completed a project to lower my stock seat without cutting out foam. This was accomplished by deleting the seat slides and replacing them with fabricated units. I netted 1" additional head room from the project. I am 6'-2" so the seat is located as far back as possible without interfering with the original floor mount locations. The seat bottom was angled up approximately 2" in the front to provide leg support. The seat mounts are made from mild steel in various sizes. Main runner - 1/4"x1-1/2" bar approximately 39 cm long. Anchor holes are aligned with original connection points. Front Anchor - 1/4"x1" bar approximately 7.5 cm long. Riser - 1"x1"x1/8" steel tube approximately approximately 4 cm long with a 14 degree angle cut. 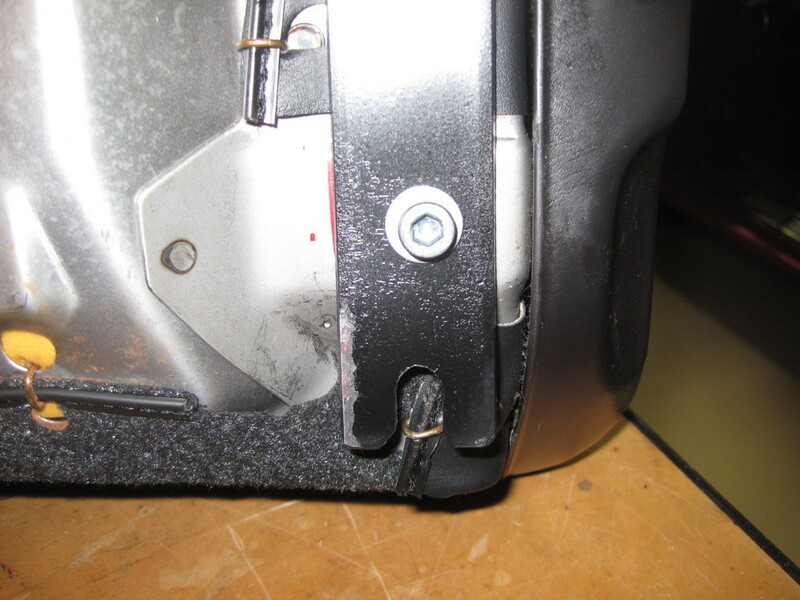 Seat belt anchor - 1/8" mild steel plate cut to match existing slide rail unit using original attachment points. Overall view of seat mount brackets mounted to seat. Right side bracket mounted to seat. 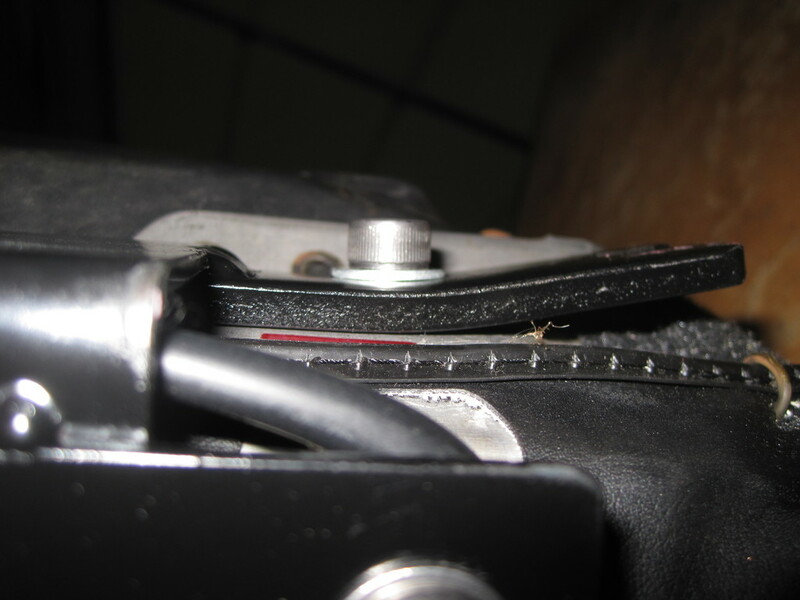 Note attachment points of bracket to original seat belt location. This requires a spacer to be welded to the bracket. Left side bracket mounted to seat. Main rail at rear of seat. Note slot for rear floor anchor bolt necessary since there is no room to drop floor mounting bolt in from the top. Note slight bend in main rail at rear to align with floor mounting point. Front mount detail. Note slight bend in bracket to align with floor mount. The rear floor mounting bolts are left in place with enough room to slide the seat rails in. Once in place and the front brackets bolted down the rear bolts are tightened. This operation is totally blind and requires a short/thin 14mm wrench. Nice piece of work! Been so long since I did my Sparcos that I'd forgotten how much "fun" sorting them out was. If you have visions of fabbing a bracket for the passenger side, you should know that the two sides have different dimensions. I think the passenger side is narrower. Don't just build one like you did and think it will fit. I always disassemble and verify dimensions before fabricating anything and I have no plans for the passenger side. Fab work looks great! Nice job! Did you reuse the original triangular plate to mount the seat belt buckle or is that a new piece as well? That is a new piece. The original piece is welded on to the slide. 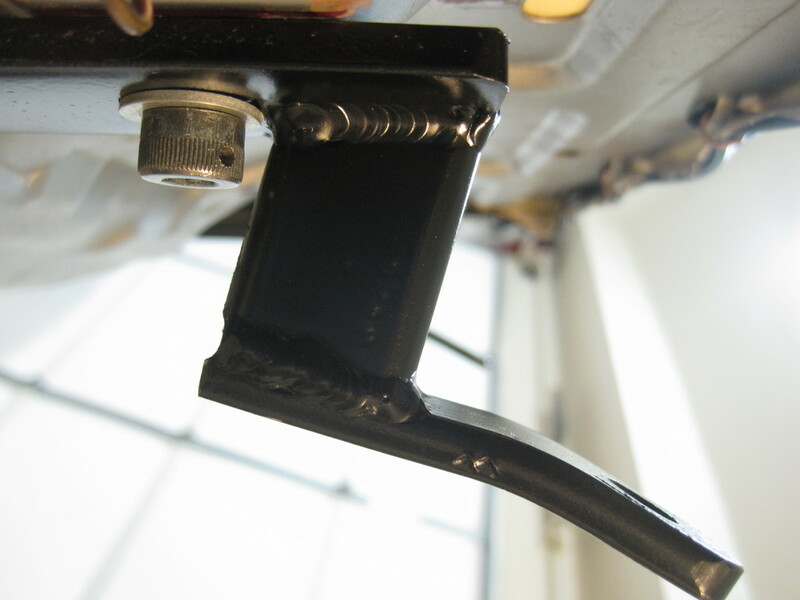 The new piece has a nut welded to the back to receive the standard seat belt attachment bolt. Very nice work. If you ever decide to build/sell a few, give me a shout. I'd buy immediately. Not ready to start a fab shop yet, but what would you guys consider a fair price for it? If I feel like I can come out a little ahead on them I might consider. Honestly, I wouldn't even know what something like this would cost. How much did it cost you in parts and material? I'd put up $100-150 for one set of rails. I'd pay right now as well.